It’s one a.m. I’m home from work after the first night of our summer Shakespeare Festival at the theatre and I am tired, yet wide awake. We got caught with our pants down tonight, unprepared, scrambling to take care of everyone. We jump, we apologize, we say, “This drink is on the house” to compensate and smile and charm and do what we can to make it right. But it’s like this sometimes, no matter what you do. It’s like this in all jobs, I think. Sometimes you miss. And there’s just nothing you can do about it but try to make it better and hope it’ll go better next time. But this is just it, our lives sometimes. We get involved. We sink in. We forget the obvious. 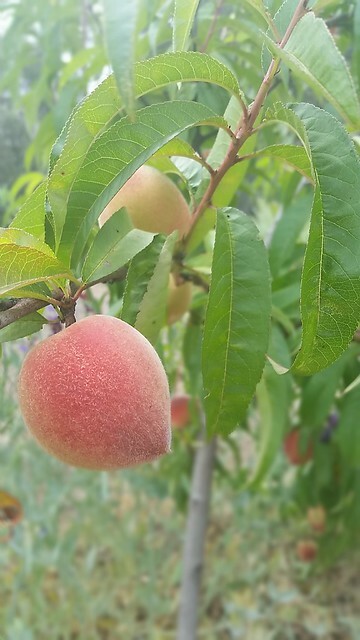 On days where we share overlapping work hours, we steal away into the park and find the hidden peach tree, heavy with fruit nobody else knows to look for. We feel like thieves, snacking on free food we found in a public space. We make plans for retirement, talk of the logistics of becoming people who secretly plant and cultivate fruit trees in public places so people can stumble across them and feel like they’ve discovered a tiny bit of treasure… sweet and sticky and ripe. We calculate the years left before we can let go of obligation and give our time to the things we love. And we do love our jobs… we just love the idea of secret orchards more, sometimes. What will we really do, once the kids are in college or off creating lives of their own? What have we put on hold to serve a larger vision? And how much can we take now? It’s one a.m. The kitties are leaping about in wild shenanigans and my belly is full. I need to be up in hours to get kids ready for camp and myself ready for work. But this moment, in this house, right now… it feels heavy and ripe and sweet. It feels like it could go on forever. It feels like tomorrow (which is actually today) is put-off-able. Secret. How much sleep, no matter how much it is needed, how much is that worth? Guess I’ll have to find out when I wake.